At the recent Clone Wars events it became clear that the little Power Distribution Board that was supplying power to the dome servos wasn’t going to cut it. It would work for a while, but the onboard 7806 regulator would soon overheated and shut down to protect itself. I’m not surprised, I currently have 8 servos in the dome, 4 for the pie panels, one for the front Holoprojector, one for a side panel, and two for the periscope – with more to be added. Idle, each requires around 8-10mA, but when active they can easily require an Amp or more under heavy load, which can add up fast when you have a few things going at once. Space is tight on the power board so it’s hard to add decent heat sinks, and even if I could I wasn’t convinced that the single 7805/ 7806 (which can deliver a maximum of 1Amp) was up to powering all the servos from one IC. One of the problems with servos is that they can sometimes stick and not return to neutral fully, and will continue to draw more power than necessary. Anyone who’s played with servos will know that if they’re even slightly misaligned or put under stress in the neutral position will cause them to hum (which means they’re drawing more than the normal 8-10mA). I’m pretty sure that’s what happens on some of my dome servos, but not all the time. It’s virtually impossible to adjust them all to be perfect, especially as things can move or shake in a fast spinning dome. The dome is fed by a 12VDC supply coming up thru the slip ring, and servo/signals are connected to a custom board at each end of the slip ring. The 12VDC routes to the power distribution board in the dome that then re-creates the various voltages I need, from 5VDC all the way to 24VDC. The solution to the servo power/overheating problem is to use a better DC regulator to replace the 7806, but I had a bunch of events coming up fast, was short on time and resource, and basically needed to fix the problem overnight. So I create a simple power board with parts I had on hand, including three 7805 regulators which would power only 4 servos each, plus I added a big heat sinks on each one and a fan to help keep them cool. Here’s the board coupled with the original servo board. It’s somewhat clunky and I will replace it at some point with a more streamlined solution and a single better regulator, but for now it worked fine to get me thru the events. If you’re interested in makng your own servo power supply or even a fully blown Power Distrubution Board, it can be done for not much money. 7805 regulators are easy to find, most surplus stores carry them for around 50c, or at a pinch you can pick them up at RadioShack for under $2. Versions that can deliver higher loads are also available, but can be harder to find or sometimes a lot more expensive. Google on “7805 circuit” or “7805 power supply” you will find dozens of examples of simple circuits to make your own boards. Here’s a good example. The regulators also come in 6, 8, 9 and 12V varieties. So as I said you could make a distribution board for not much money if you’re up to the challenge. I also have to stress again that I’m not an electronics expert. Please double check anything before trying to copy me. In this case there are definitely better was to ‘fix’ this problem. I added some support brackets to the slip ring servo boards. Nothing fancy just a small piece of extruded aluminum with a few holes in it. I made them slightly longer than the boards to allow extra holes for mount. I finally got a chance to fully test out my slip ring last night with some servos. I first had to finish soldering up my little boards that would handle signal routing and power. Rather than try and explain in words and pictures how the setup works I made this short video to try and give a good overview and show the slip ring in action. I still need to make little brackets to secure the D sockets to the boards, and decide the best place to locate them in Artoo. 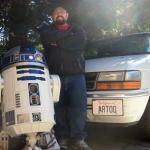 The last couple of weeks I’ve been busy getting Artoo back together for a couple of important events. I’ve totally overhauled the electrical system (again) and I’m hoping this will be it for a while. At the hospital visit on Saturday I ran Artoo for about 4-5 hours on the new system and the 18Ah batteries without any sign of slow down, and I continued to run him again the next day for few more hours on the same charge. I must admit that I didn’t do lots of long sprints, but I’m confident that my earlier battery problems are fixed. With that said, here’s a summary of the electrical work and the new electrical system design. The following schematic outlines the 3 main areas of my setup. The red area is the front charging port, flashing LEDs and the battery select/on/off switch. Yellow is the wiring harness/relays that does all the magic of switch batteries between charing mode or running the droid, and finally the blue on the right is the rear electrical panel containing the speed controllers, fuse block, battery monitor, and power distribution board. It also contains an additional relay/power jack to run the drive from 120VAC/12VDC adapter. There’s also a PDF version that maybe easier for printing. 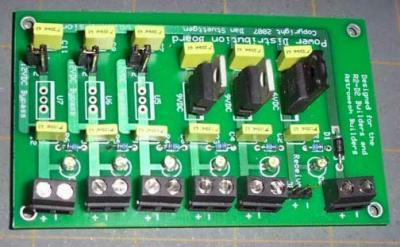 Here’s a photo of the battery select relay/wiring harness (yellow section of the schematic). It uses 3 automotive relays to do the battery switching for charging and to turn Artoo on and off. This is the front charing port (red section on the schematic) you’ve probably seen before. The attaced board to the right is the PICAXE controller that flashes the lights when the front door opens, and the smaller board to the left just contains a 7805 5VDC regular to power the PICAXE. The wiring harness above connects to to the charging socket. In addition to adding the extra relays to switch two sets of batteries, I replaced the large MAXI fuse block/voltage display with a much smaller ATO fuse block and a separate LED voltage meter display. I mounted the voltage meter on the rear electrical panel, and instead of using one for each of the batteries I decided to use just one with a switch to flip between batteries. The board requires a separate 5VDC supply to operate and I got this from the power distribution board. Here’s the new rear panel. Going clockwise, top left is the battery monitor, then the Vex Micro-controller and receiver, below that is the power distribution board, and below that the fuse block, to the left the RoboteQ AX3500 speed controller for the drive motors, and above that the Syren10 speed controller which turn the dome. I also worked on getting the slip ring soldered up and installed. And I made up little boards for it to plug into. 12VDC power is connected to the blue terminal block, and the control/servo cables on the 3 pin connectors. There a very similar board in the dome, but with an additional 5VDC input from a 7805 regulator IC to power the servos. Just a short video testing out the newly mounted slip ring. No power is being routed yet, but I wanted to see how it worked in place and if there was any pulling on the cable. I cut the hole for the slip ring tonight. Started off by marking the center lines and then using a hole cutter to score the 7/8″ outline where the slip ring body would sit. I started work on my test slip ring tonight and hope to get it installed in the next few days and report back on a new group order. The sample slip ring has eighteen 2A circuits and I plan on grouping together 6 or 8 for the +/- 12VDC uplink to the dome, leaving ten circuits for PWM/servo signals. To save on circuits I’m not planning on routing the +/- 5VDC from each of the PWM pairs through the slip ring. As a result each RC channel will require just one wire allocated on the slip ring. I’ll just tap of the 12VDC in the dome and re-create a separate 5VDC supply for the servos. Out of the box the slip ring wires are loose and really needed protecting. I bought some braided expandable nylon wire wrap from a local surplus electronics store for less than a dollar. I wrapped the ends in electrical tape to hold things in place. Now that I have the wire wrap in place I can start soldering the wires to the connectors. A slip ring, in electrical engineering terms, is a method of making an electrical connection through a rotating assembly. In our case it could be used to route power and other signals into the dome, but still allow it to rotate continuously without tangling wires. I’m upgrading my RC setup to 2.4Ghz in the next month, and this would allow me to eliminate an expensive second receiver in the dome. Here’s a quick picture of a sample I picked up today. It’s pretty small, but offers 18 circuits, each capable of 2A. The company that sells them is close to where I work and they also sell a much smaller 6 circuit design as well as 12 and 24 in the same size package as above. I plan on testing it out in the next couple of weeks and will report back on my findings.